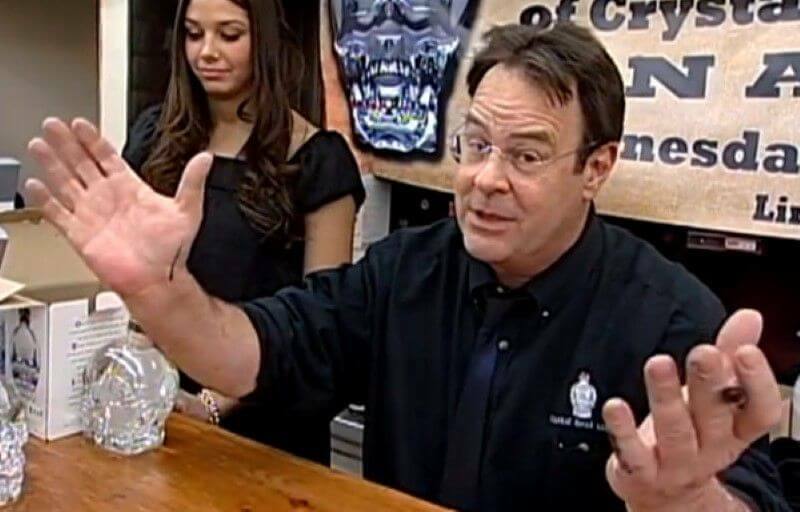 Dan Aykroyd, famous for his role in The Blues Brothers, speaks candidly of his interest in Ufology at a Crystal Head Vodka (Aykroyd’s vodka brand) signing event at a liquor store in in Attleboro, MA. As many will already know he’s appeared in a 2005 documentary called ‘Dan Aykroyd Unplugged on UFOs‘. Aykroyd’s knowledge and interest in ufology is evident as he mentions famous cases and books such as Flintstone sounding film Captured: The Betty and Barney Hill UFO Experience (by UFO researchers Stanton Friedman and Kathleen Marden) and the Tinley Park UFO sightings in Illinois. Aykroyd also goes on to describe his own experience of seeing two UFOs in Martha’s Vineyard. Massachusetts, flying wing to wing, 100k above and at an estimated 20k miles per hour. He also claims that there were 3 other witnesses, other than himself, who witnessed this event. Aykroyd explains that he observed two UFOs flying wing to wing in Martha’s Vineyard, Massachusetts, which he estimated to be flying at 100,000 feet and at an incredible 20,000 miles per hour. He claims that three other witnesses also observed the unknown craft.